Barry Fry admitted he had been a “prat” during an FA misconduct hearing. The Peterborough United director of football was suspended from all football-related activity for a month - with a further three months suspended - and fined £35,000 after admitting a charge relating to betting misconduct. The written reasons behind his suspension have now been released by the FA and confirm a previous story from the Peterborough Telegraph that Mr Fry had placed bets as insurance against potential bonus payments should Jack Marriott be top goalscorer or Posh be promoted last season. Insurance to cover bonuses is commonplace in football, but the FA strictly forbid the use of bookmakers for football wagers by all employees of every club. Mr Fry interrupted his own counsel’s closing submissions to tell the Regulatory Commission he could see he had “been a prat”. The commission noted that it “finds it hard to disagree with the sentiment”. The bets which landed Mr Fry in trouble were placed at a Coral in Bedford and were paid for with petty cash from Posh. One was a £1,000 bet (£500 each way) on Mr Marriott being top scorer in League One for the 2017/18 season which came through after the striker scored 27 goals. Mr Marriott had a bonus of £25,000 for being top scorer, the same amount which Mr Fry won with his bet which he then paid back to the club. 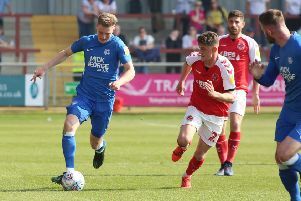 It was revealed that Posh chairman Darragh MacAnthony had been told by Mr Fry in “some fairly casual and informal way” that he was insuring the club against Mr Marriott’s £25,000 bonus, but did not reveal it was being done as a bet. It was noted by an FA representative that if Mr Marriott had been second, third or fourth top goalscorer in League One, Mr Fry would have made winnings of £4,500 but Mr Marriott would not have been due a bonus. Further bets totalling around £4,000 (half of which were each way) at odds between 25-1 and 20-1 were made on Posh finishing top of League One. If the club had finished top Mr Fry’s winnings would have been around £50,000, and if Posh had finished in second, third or (possibly) fourth place, his winnings would have been around £10,000. The FA said Posh had insured for £500,000 against promotion. With a first place finish costing the club £925,000 in bonuses, the report stated that more than £350,000 would have been uncovered by either the insurance or Mr Fry’s betting. In the end the club finished ninth.
. Mr Fry’s counsel urged that no suspension should be imposed and that there should be only a very modest fine. The commission took into account Fry’s “previously unblemished disciplinary record” and “dedicated and positive contribution to English football over several decades”, including 23 years at Posh. His ban started on February 1.